Pizza is Greek in origin. The Ancient Greeks covered their bread with oils, herbs and cheese. In Byzantine Greek, the word was spelled πίτα or pita, meaning pie. The word has now spread to Turkish as pide, and Bulgarian, Croatian and Serbian as pita, Albanian as pite and Modern Hebrew pittāh. The Romans developed placenta, a sheet of dough topped with cheese and honey and flavored with bay leaves. Modern pizza originated in Italy as the Neapolitan pie with tomato. In 1889, cheese was added. The bottom of the pizza, called the ‘crust’, may vary widely according to style—thin as in a typical hand-tossed pizza or Roman pizza, or thick as in a typical pan pizza or Chicago-style pizza. It is traditionally plain, but may also be seasoned with garlic, or herbs, or stuffed with cheese. Nestled in a small corner near Toit in Indiranagar, this little restaurant is the perfect pizzeria haven. One of the few places in Bangalore using a wood fire oven, Huckleberry uses fresh ingredients which makes their pizzas stand out in taste and quality. Try their Lamb and Caramelized Onion pizza and the Jalapeno and Sweet Corn pizza. It’s simply delicious! This is one of our favourite Italian restaurants that never disappoints us. 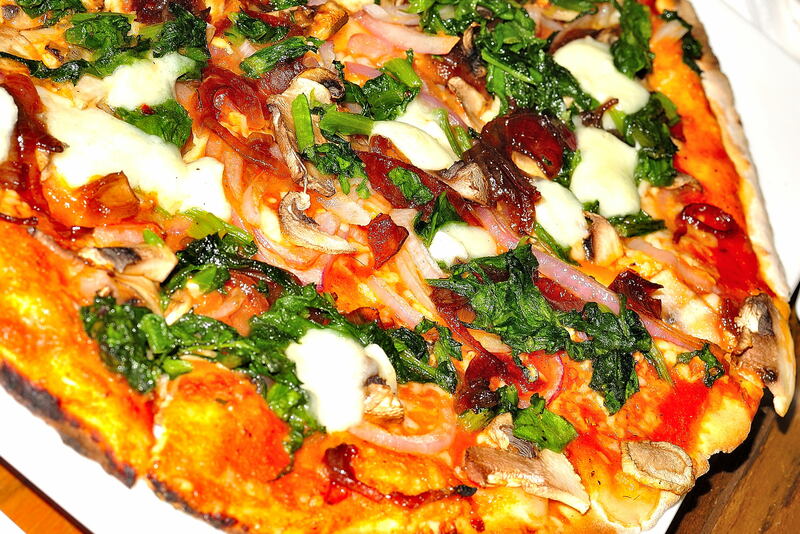 While they are purely vegetarian, their freshly made thin crust pizzas are really to die for. Our favourites here are Pizza ala Vodka (Mozzarella, Parmesan, jalapeno, red pepper, capers, pineapple and a dash of vodka) and the incredibly sinful four cheese pizza, Calabrese (Mozzarella, Gouda, Cheddar, Miraj cheese and olives). Orgasmic. One of the first through and through city-based pizzerias in Bangalore, Pizzeria Romano is a crowd favourite. A restaurant theme befitting that of Hollywood and rock ‘n’ roll, the pizzas rolled out are 100% Italian and spiced up to your liking. We suggest the Roadies Pizza (crushed garlic, Kalamata olives, marinated mushroom and Mozzarella) and the super indulgent Buffalo Soldier (grilled chicken in spicy Buffalo wing sauce, diced tomatoes, onion, Cheddar and Mozzarella). A great pub in Bangalore serving up some equally great food, this place is not famed too much for their pizzas, but we really like them. Something about the ambience, the great booze, the crowd and the music that makes those thin crust pizzas a whole lot tastier and crunchier. We are big fans of the Seafood Pizza (loaded up with all of the freshest seafood) and the Mexican Beef & Jalapeno Pizza (the flavours make it more exotic and tasty). Yeah, don’t kill us. While we like all of those amazingly exotic woodfire thin crust pizzas, we need our shot of greasy pizzas off cardboard boxes from time-to-time as well. And, Domino’s is really one of the best among the chains. 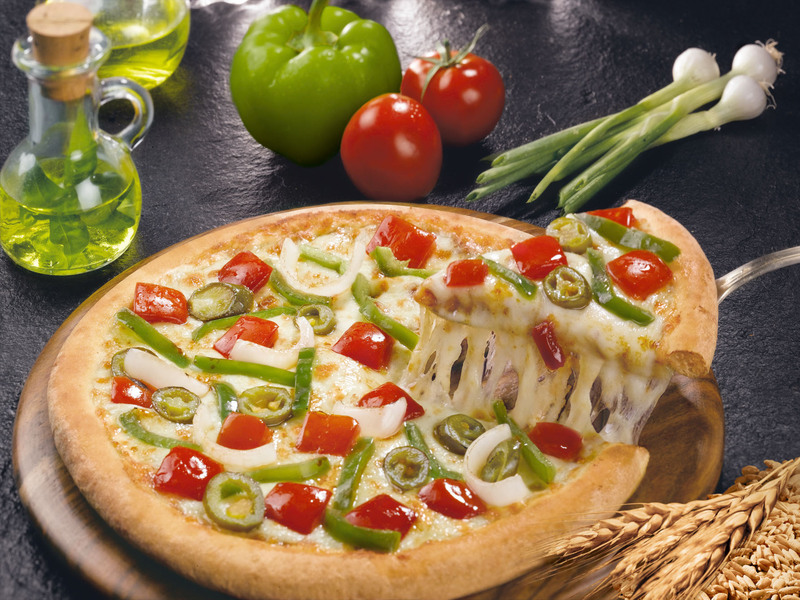 We love the Mexican Green Wave pizza (onion, capsicum, tomato jalapeno and Mexican herbs) and Chicken Golden Delight pizza (golden corn, double BBQ chicken and extra cheese) loaded with the Cheese Burst. One bite and all of that cheesy goodness takes you to heaven. Guaranteed.